It can be really challenging for a freelance translator working from home to focus on their work and produce an accurate translation in the shortest time possible or at least before the deadline. The distractions are many: your TV is on, your phone keeps ringing, you have an energetic toddler playing near your desk and/or a pet running around the house, you are a social media addict (you keep checking your Twitter and Facebook accounts every other minute), you have house chores, etc. As easy as getting distracted can be, it is equally as easy to actually stay focused if you have the right mindset. I’ve been a freelance translator for the past 7 years and I have a few tricks up my sleeve to keep me from being distracted when I have several translation jobs on hand and I really need to be as productive as possible. 1- Have the right mindset: when you focus on the idea that you need to be productive and that you could have been working in-house instead of having a flexible schedule, it will be easier for you to actually put off all the other concerns on your mind (daily or personal issues). Consider yourself an in-house translator: I’m sure you can’t talk about your personal life/struggles/concerns at work. Therefore, leave all that behind, turn off the TV and close all social media applications found on your phone. After all, those are the most distracting elements. 2- Keep everyone else around busy: by keeping your child (if any) active, you will have a better time focusing on producing a high quality translation. As for pets, they can manage to stay calm if you just keep in mind that it’s not play time! 3- Have your own “space”: Having your own home office or desk really helps. I find I’m the most productive when I am home alone, sitting at my desk and really just going for it. If you are finding there are too many distractions at home, particularly if you have a tight deadline to meet, it can sometimes be beneficial to rent an office or a hot desk temporarily. 4- Be organized: there’s a time for everything. If you keep taking breaks from your work to go run another errand (do the words “laundry” or cooking” ring a bell? ), you might not finish on time, and you wouldn’t have focused fully on the job you had. Simply put a schedule and set your working hours and your breaks, and stick to this schedule. By doing so, you finish everything on your to-do list and you feel more accomplished. 5- Put on some music: I’m sure not everyone would agree on this tip, but at least it works for me sometimes, especially when I have some copy-writing or proofreading to do. When I have translation jobs, I prefer having a quiet surrounding, but music really helps me get in the mood for creative writing and brainstorming. 6- Do take breaks: when you work too hard for long periods of time, it gets harder to remain focused. Your brain needs a break, and that is when you really have to take one. As little as 5 minutes can be enough to get you back on the concentration track. Consider taking 5-minute breaks every 90 minutes to a couple of hours; not only is it healthy for your brain, but it is also good for your body. After all, sitting at a desk for too long is quite tiring and stressful. More concentration ==> more work done ==> more experience ==> eventual success. 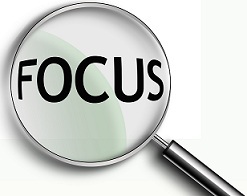 If you have other tips to stay focused during work, please feel free to share them with us!